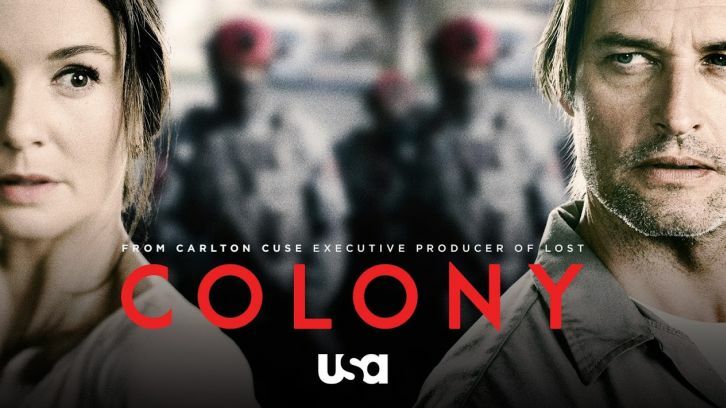 USA’s “Colony” – a dystopian drama that returns for a second season on January 12th – borrows elements from at least two other shows we’ve written about in this space. One is AMC’s “Fear the Walking Dead” set in downtown Los Angeles; the other TNT’s “Falling Skies” -- a series that starts out after space invaders have ravished the earth. Indeed, the setting for “Colony” starts out in Los Angeles, but this isn’t the sunny L.A. of palm trees and cars. Instead, it’s a scary, post-invasion walled off city controlled by alien invaders! Not that you ever see the space invaders. What we have in their place is a futuristic, Gestapo-like constabulary adorned with red helmets. You can’t miss them. There are also citizens-turned-collaborationists, who have decided to throw their lot in with the space invaders. And their motivation for turning against their own neighbors and friends? All the usual reasons apply – safety, survival and the ability to live a “normal life” with plenty of luxuries denied to everyone else, especially the citizen resistance-fighters. Swimming around in this pretty kettle of fish is the Bowman family of five, headed up by Will (played by the actor, Josh Holloway) and his wife, Katie (played by Sarah Wayne Callies – the actress well-known for her role as Lori Grimes in “The Walking Dead.”) They’ve got a big problem on their hands… that only gets bigger. Way bigger. They lost their son during the alien invasion, and Will tries to escape from L.A. to find him. But his search doesn’t get very far -- he is caught at the city gates and coerced by a sinister collaborationist (and L.A. Governor), Alan Snyder, (played by the actor, Peter Jacobson) to turn against the resistance movement. But as fate would have it, his wife is a secret operative of the resistance movement, thus directly pitting husband and wife against one another. 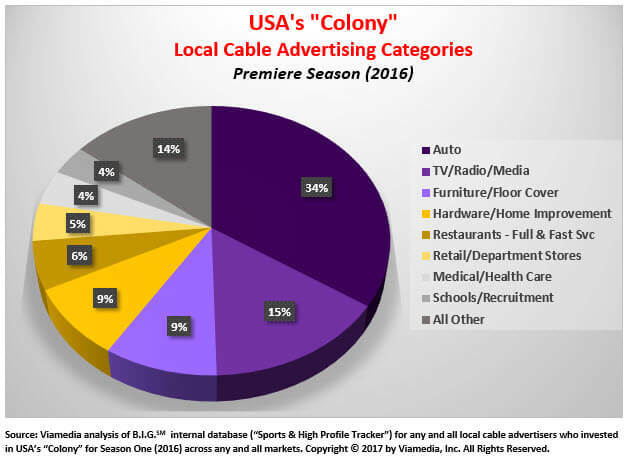 USA’s “Colony” has been on air for only one season, so we have no baseline comparisons to quantify year-over-year sales metrics. 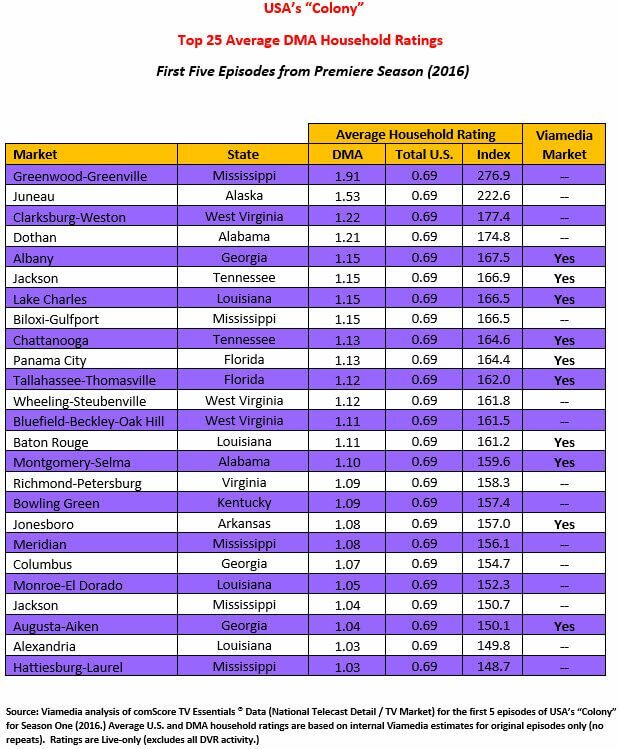 But based on records we have for other first year shows, “Colony” received strong support in its inaugural season. All in all, the show attracted 68 advertisers who ordered 400 spots across 32 Viamedia markets (40+% of Viamedia’s national footprint.) That comes to an average of 5.9 spots per advertiser. USA’s “Colony” didn’t exactly break new ground in depicting a dystopian society in the throes of an alien conquest. Clearly, the creators borrowed liberally from several past and current TV dramas. Of course, there’s nothing wrong with that, but it may in part explain why the ratings from Season One were somewhat lackluster (at least by USA’s standards.) But this show has a lot of potential with compelling action sequences, not to mention several first rate actors. 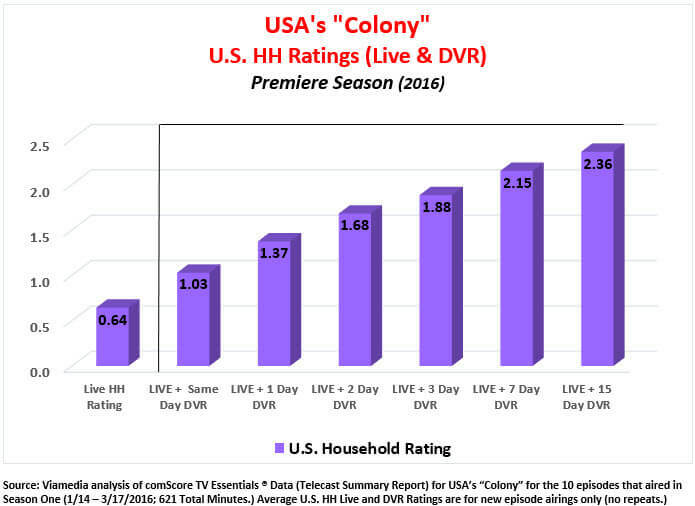 And when we consider extended DVR activity, “Colony” has engaged an audience of several millions – a very strong base upon which to launch Season Two.